The 21st time was the charm for the Lady Flames (12-5-1, 7-2-1 Big South) soccer team, as they scored on their 21st attempt to take a 1-0 lead in their match Saturday, Oct. 26 against Coastal Carolina (9-8-1, 6-4 Big South). Junior midfielder Rebecca Smith placed the ball into the back of the net after a shot by fellow midfielder Brittany Aanderud hit off the right post. This lone goal was all that Liberty needed for the win in its last regular season home game of the year. Before the game, Liberty honored their three seniors as well as their parents in front of a home crowd of more than 500 fans. “We just figured this is for our seniors, and we are going to go all out,” Smith said. 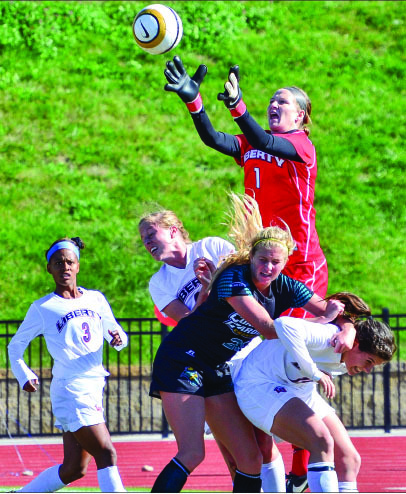 Coastal Carolina opened the game with two quick shots on goal in the first few minutes of the match, both resulting in saves by Liberty goalkeeper Holly Van Noord. Liberty dominated the rest of the game, outshooting Coastal Carolina 26-11, but failed to take advantage of most of their opportunities. Coastal Carolina keeper Megan Spencer also made many well-timed saves, ending the afternoon with eight saves overall. In the first half, Liberty outshot Coastal Carolina 13-4. The first half ended with the Chanticleers nearly taking a 1-0 lead on a ball passed ahead of Coastal’s forwards into Liberty’s penalty box, but Van Noord darted off her line to cover up the ball. Liberty opened the second half with accurate shooting, placing three of their first four shots on goal, but Spencer responded with several saves. As the game entered its final minutes, a fortunate bounce for Liberty off Aandersud’s shot gave Smith the opportunity to score the winning goal. Liberty is currently third in Big South standings behind Radford (9-1-0) and Longwood (8-2-0) and will travel to Longwood Tuesday, Oct. 29.